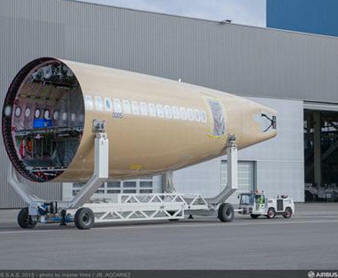 November 4, 2013 - Assembly of MSN5, the fifth and final member of the A350 XWB flight test fleet is now underway with the fuselage joining process. This follows the recent arrival of the three fuselage sections at the A350 XWB final assembly line in Toulouse, France. The Airbus A350 XWB is a family of long-range, two-engine wide-body jet airliners developed by European aircraft manufacturer Airbus. The A350 is the first Airbus with both fuselage and wing structures made primarily of carbon fiber-reinforced polymer. It can carry 250 to 350 passengers in a typical three-class seating layout, or maximum seating of 440 to 550 passengers, depending on variant. MSN5 is the second of the A350 flight test aircraft that will feature a passenger cabin. This aircraft will fly for the first time in Spring 2014 and will be used essentially to perform cabin related flight tests. It will also participate in the Early Long Flights where the “passengers” are Airbus employees. This allows the cabin and related systems to be submitted to near realistic operations in order to ensure a mature cabin at entry into service. In addition, MSN5 will carry out Route Proving flights to demonstrate to the certification authorities that the aircraft performs perfectly in airport operations.